There are a few spots left! Plan to come early and be one of 25 on a private journey through one of the world’s great food scenes! 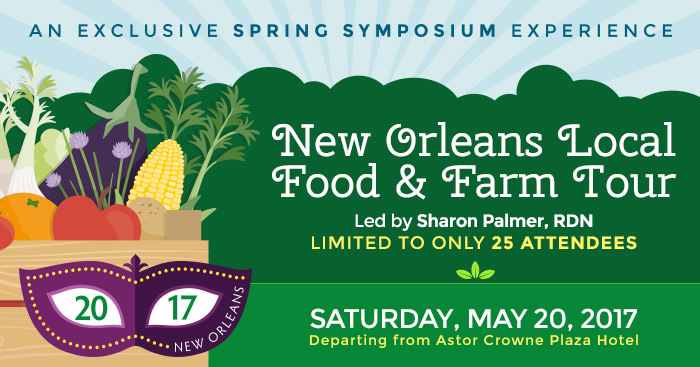 Add a day to your Today’s Dietitian Spring Symposium stay and enhance your experience with this special and intimate look at the local food scene in New Orleans. This fun and information-filled event will give you an opportunity to observe highlights of the local food, farm, and hunger organizations in New Orleans. Led by Sharon Palmer, RDN, you will have the opportunity to gain access to a personalized tour of local venues, as well as taste local, seasonal food prepared by an award-winning chef. Numbers are limited to only 25 attendees in this small, private tour, which is $129 per person and includes transportation, tours, and lunch. Space will be awarded on a first-come, first-serve basis and tour participants must be registered for the symposium to attend. View The Itinerary & Register Now! Thanks to our sponsors for their support of continuing education in nutrition and dietetics.